Today is a lovely day, the sun is shining and i just want to be sitting in a beer garden with a cocktail in my hand. But no, i'm stuck inside. But i've had quite a productive day as i've spent it catching up with loads of blogs! Haven't read blogs properly for a long time, so thought i'd login to my BlogLovin and start going through the huge amount of reading i need to do. I find reading blog posts is great for inspiration & motivation, as it can give you great ideas for your future posts, and you can see the different types of photography too. This is a simple 'me' outfit. A top, blazer & a tube skirt and i'm ready to go. I thought i'd show you this outfit as i think it's quite nice. I bought this top from Boohoo and it came in the next day delivery along with the blazer i'm wearing and a couple other bits. (I didn't pay for next day delivery so was pleasantly surprised by this.) I love horoscopes, i don't avidly follow it, but every now and again i will have a little looksie and see what's going on in the world of a Sagittarius! This top has the symbol of my star sign with the words 'positive. honest. proud'. Well positive and proud are two things i am not though i try to be. 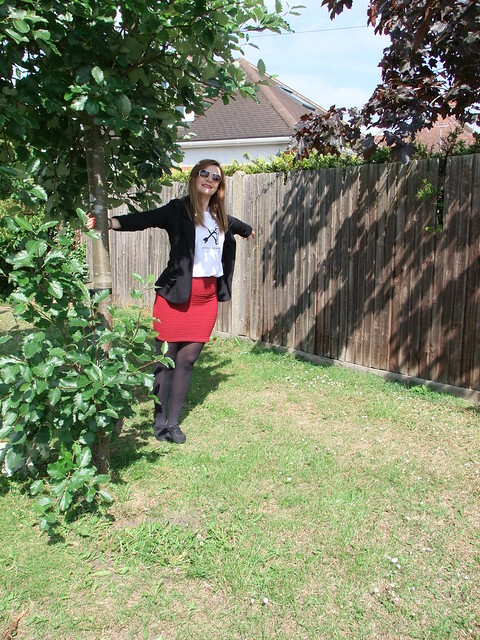 I thought the tee was really cute and it was so inexpensive at £6! 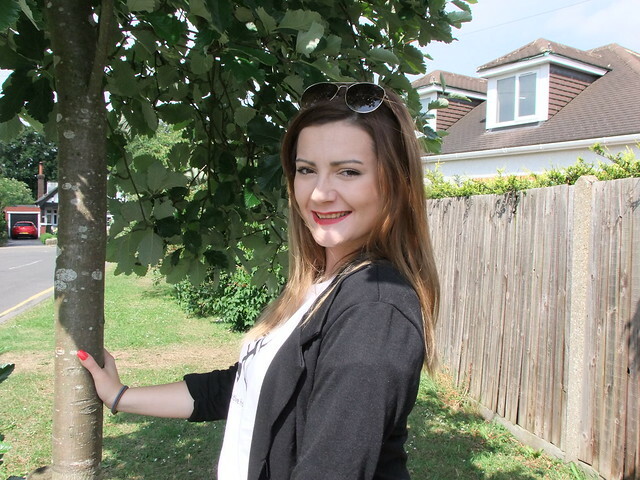 I've needed a new blazer for ages now, i think i said in my last post which you can view here, that all my blazers are tatty or don't fit me as nicely anymore, so i bought this one which was an absolute bargain at £15. Normally to get a cheap blazer that's still alright quality you need to be spending £25+ but when this arrived i instantly fell in love with it. 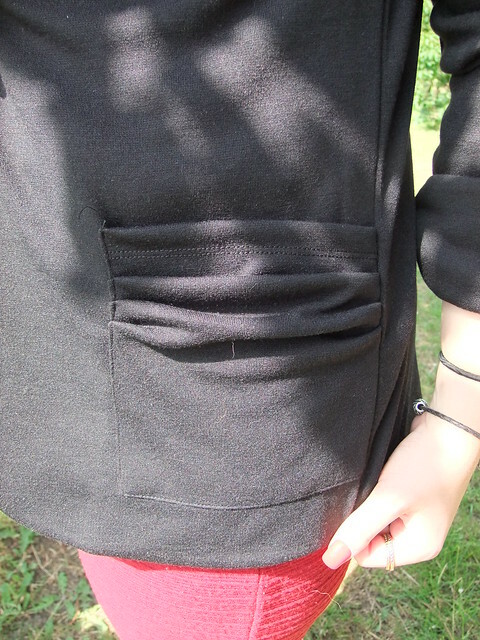 It's so soft, and the layered pocket detailing that's shown in one of the photos above is just so cute. I thought a nice off-red tube skirt would look quite nice with this look, this skirt is ribbed and i just love, it's so comfortable! 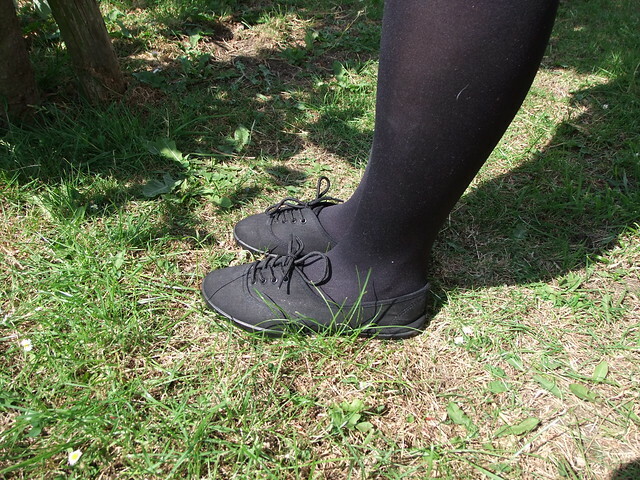 I'm not actually wearing smart shoes in this outfit *everybody screams*, i decided to wear some black plimsolls instead. Yes, i still more or less only wear black footwear (hopefully that changes soon), but i think they make this outfit look a bit more relaxed. I love the horoscope-themed shirt! I don't put much stock into horoscopes but I love reading up on them haha. Very beautiful! I love your style! nice tee! And the skirt adds nice colour to this look! Interesting post , amazing outfit, I love it. You look fabulous , thanks for sharing!!! 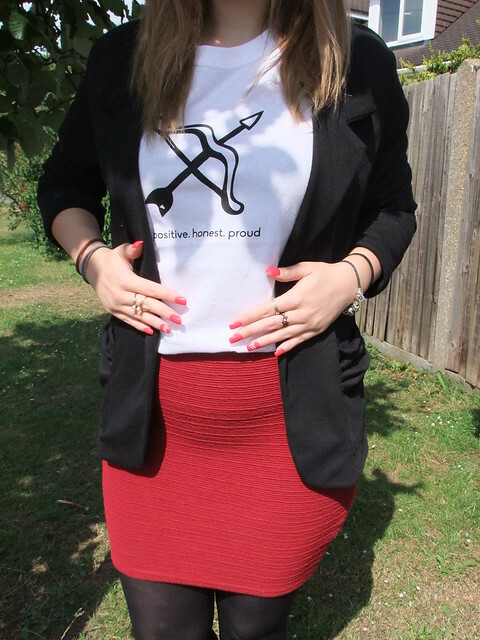 Love your skirt, the tube bodycon style really suits you! And boohoo are awesome with their delivery, their always seems to be some sort of offer on next day! Top blazer and skirt, what a smart style! 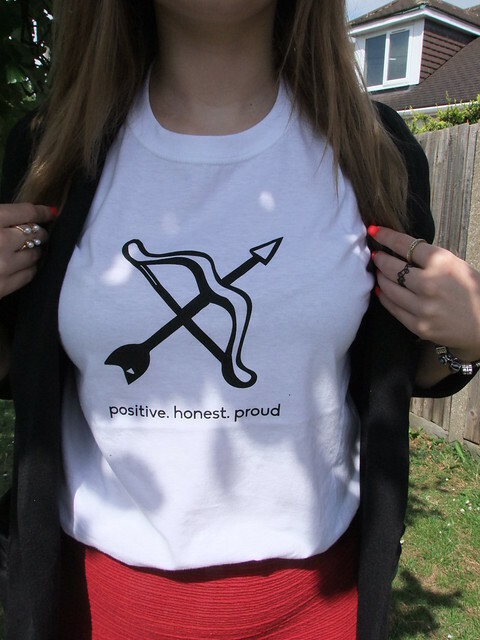 I love the message on the Tshirt as well :) Positive, honest and Proud. AWESOME words to live by!